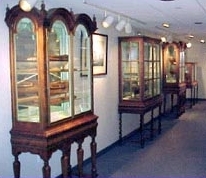 Located on the 2nd deck of the Naval Academy Museum, the Class of 1951 Gallery of Ships houses one of the world's finest collections of warship models from the 17th, 18th, and 19th centuries. Each of these priceless models was constructed within a few years of the ship or ship type it represents. 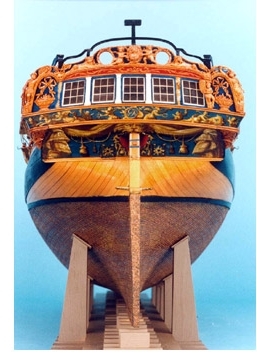 For example, the 96-gun ship-of-the-line St. George was launched in 1701, and her model was completed about a year later. The models were crafted with remarkable precision. Careful attention was paid to detail, especially the carvings and fittings above and below decks. This supreme craftsmanship rendered the models into exquisite works of art, and today they often constitute the only surviving physical record of ships built during the classic Age of Sail. The models are displayed with four dioramas which illustrate: life between decks c.1650, a ship model maker's shop c.1700, navigation and signaling c.1750 and a quarterdeck c.1800. The Rogers Collection models represent almost every rate and type of warship built between the mid-1600s and the 1840s, from a huge "first rate" ship-of-the-line carrying 100 guns to a "sixth rate" vessel of only twenty guns. In addition to the larger models, the gallery displays a royal yacht, an admiral's barge, and several ships' boats. Completed models may have open-framed or solid hulls. They can be either fully rigged or unrigged. The Naval Academy's bone model collection ranks as one of the largest in the world. The exhibit is a poignant and fascinating tribute to the skill of prisoners who were kept in deplorable conditions for years on end. These artifacts were carved from the bones of the beef rations allowed to French prisoners-of-war during their incarceration in England. The crafting of this type of model was characteristic of the period of the Anglo-French wars (1756-1815), and most of these works were produced during the Napoleonic Wars. While not built to scale, these miniature vessels are every bit as thorough in their workmanship as their wooden counterparts. Many models are displayed in original antique cases built specifically for their exhibition. The cases from the William and Mary and Queen Anne periods are as valuable as the objects they hold. They make the Academy's collection truly unique. Throughout the gallery are many examples of prints from the Museum's Beverley R. Robinson Collection. The images illustrate important battles, famous ships, and well-known naval officers from all over the world. The ship model collection requires continual care and maintenance if it is to be preserved for future generations. A fully equipped ship model shop with laboratory space for a conservator is located on the ground level of the museum. Visitors may view the shop and projects underway through an observation window located just passed the elevators.